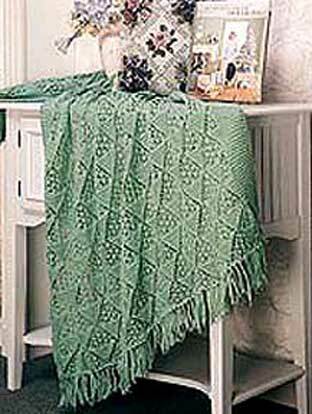 Triangle design motif is repeated to give this elegant afghan a subtle texture. 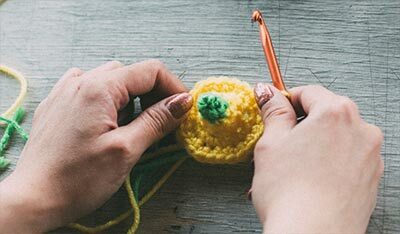 The pattern looks complicated but once you master the pattern stitch, it will be easy knitting! Gauge or Tension: 18 sts and 27 rows to 4" [10 cm], measured over pattern, using suggested needle or any size needle which will give the correct stitch gauge or tension. 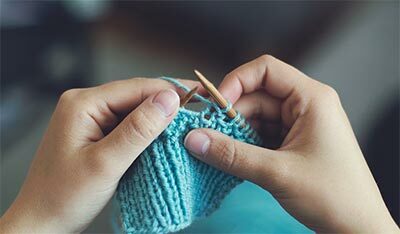 Abbreviations: K, knit; p, purl, st, stitch; sts, stitches; rep, repeat; tog, together; yds, yards; ", inches; mm, millimeter;cm, centimeters; gm, gram; rem, remain or remaining; sl, slip; yo, yarn over needle; tog, together; sl, slip; psso, pass the slipped stitch over the knit stitch. Please follow washing and drying instructions printed on the yarn label. SlK psso - Slip, Knit, pass slipped stitches over: Slip next 2 stitches onto right-hand needle as if to knit 2 together, knit next stitch, then pass the first 2 slipped stitches over the knit stitch. Using circular needle, cast on 207 sts. Next Row: Knit. Next Row: (eyelet row - wrong side) K1, *yo, k2tog; rep from * to end. Row 1: K 13, place a marker, k7, k2tog, yo, *k1, yo, sl 1, k1, psso, k 13, k2tog, yo; rep from * to last 23 sts, k1, yo, sl 1, k1, psso, k7, place marker, k to end. Row 2: K to marker, k7, p5, *k 13, p5; rep from * to last 20 sts, k to end. Row 3: K to marker, k6, k2tog, yo, k3, *yo, sl 1, k1, psso, k11, k2tog, yo, k3; rep from * to last 21 sts, yo, sl 1, k1, psso, k to end. Row 4: K to marker, k6, p7, *k 11, p7; rep from * to last 19 sts, k to end. Row 5: K to marker, k5, k2tog, yo, k1, yo, *SlK psso, yo, k1, yo, sl 1, k1, psso, k9, k2tog, yo, k1, yo; rep from * to last 24 sts, SlK psso, yo, k1, yo, sl 1, k1, psso, k to end. Row 6: K to marker, k5, p9, *k9, p9; rep from * to last 18 sts, k to end. Row 7: K to marker, k4, [k2tog, yo] twice, k3, *[yo, sl 1, k1, psso] twice, k7/, [k2tog, yo] twice, k3; rep from * to last 21 sts, [yo, sl 1, k1, psso] twice, k to end. Row 8: K to marker, k4, p 11, *k7, p 11; rep from * to last 17 sts, k to end. Row 9: K to marker, k3, k2tog, yo, k3, yo, *SlK psso, yo, k3, yo, sl 1, k1, psso, k5, k2tog, yo, k3, yo; rep from * to last 24 sts, SlK psso, yo, k3, yo, k2tog, k to end. Row 10: K to marker, k3, p 13, *k5, p 13; rep from * to last 16 sts, k to end. Row 11: K to marker, k2, k2tog, yo, k1, yo, SlK psso, yo, *k3, yo, SlK psso, yo, k1, yo, sl 1, k1, psso, k3, k2tog, yo, k1, yo, SlK psso, yo; rep from * to last 24 sts, k3, yo, SlK psso, yo, k1, yo, sl 1, k1, psso, k to end. Row 12: K to marker, k2, p 15, *k3, p 15; rep from * to last 15 sts, k to end. Row 13: K to marker, k1, [k2tog, yo] twice, k3, yo, *SlK psso, yo, k3, [yo, sl 1, k1, psso] twice, k1, [k2tog, yo] twice, k3, yo; rep from * to last 24 sts, SlK psso, yo, k3, [yo, sl 1, k1, psso] twice, k to end. Row 14: K to marker, k1, p 17, *k1, p 17; rep from * to last 14 sts, k to end. Row 15: K to marker, k2tog, yo, *k3, yo, SlK psso, yo; rep from * to last 18 sts, k3, yo, sl 1, k1, psso, k to end. Row 16: K 13, p to last 13 sts, k 13. Row 17: K to marker, *k1, yo, sl 1, k1, psso, k 13, k2tog, yo; rep from * to last 14 sts, k to end. Row 18: K to marker, p3, k 13, *p5, k 13; rep from * to last 16 sts, p3, k to end. Row 19: K to marker, k2, yo, sl 1, k1, psso, k 11, k2tog, yo, *k3, yo, sl 1, k1, psso, k 11, k2tog, yo; rep from * to last 15 sts, k to end. Row 20: K to marker, p4, k 11, *p7, k 11; rep from * to last 17 sts, p4, k to end. Row 21: K to marker, k2tog, yo, k1, yo, sl 1, k1, psso, k9, k2tog, yo, *k1, yo, SlK psso, yo, k1, yo, sl 1, k1, psso, k9, k2tog, yo; rep from * to last 16 sts, k1, yo, sl 1, k1, psso, k to end. Row 22: K to marker, p5, k9, *p9, k9; rep from * to last 18 sts, p5, k to end. Row 23: K to marker, k2, [yo, sl 1, k1, psso] twice, k7, [k2tog, yo] twice, *k3, [yo, sl 1, k1, psso] twice, k7, [k2tog, yo] twice; rep from * to last 15 sts, k to end. Row 24: K to marker, p6, k7, *p 11, k7; rep from * to last 19 sts, p6, k to end. Row 25: K to marker, k2tog, yo, k3, yo, sl 1, k1, psso, k5, k2tog, yo, k3, *yo, SlK psso, yo, k3, yo, sl 1, k1, psso, k5, k2tog, yo, k3; rep from * to last 15 sts, yo, sl 1, k1, psso, k to end. Row 26: K to marker, p7, k5, *p 13, k5; rep from * to last 20 sts, p 7, k to end. Row 27: K to marker, k2, yo, SlK psso, yo, k1, yo, sl 1, k1, psso, k3, k2tog, yo, k1, yo, SlK psso, yo, *k3, yo, SlK psso, yo, k1, yo, sl 1, k1, psso, k3, k2tog, yo, k1, yo, SlK psso, yo; rep from * to last 15 sts, k to end. Row 28: K to marker, p8, k3, *p 15, k3; rep from * to last 21 sts, p8, k to end. Row 29: K to marker, k2tog, yo, k3, [yo, sl 1, k1, psso] twice, k1, [k2tog, yo] twice, k3, *yo, SlK psso, yo, k3, [yo, sl 1, k1, psso] twice, k1, [k2tog, yo] twice, k3; rep from * to last 15 sts, yo, sl1, k1, psso, k to end. Row 30: K to marker, p9, k1, *p 17, k1; rep from * to last 22 sts, p9, k to end. Row 31: K to marker, k2, yo, SlK psso, yo, *k3, yo, SlK psso, yo; rep from * to last 15 sts, k to end. Row 32: K 13, p to last 13 sts, k 13. Repeat these 32 rows of pattern 11 times more, then rep Rows 1 through 16 once. Next Row: (eyelet row - right side) P1, *yo, p2tog; rep from * to end. Cut remaining yarn into 10" [25.5 cm] lengths. Knot 2 strands in each yo of eyelet rows across each short end of afghan. EVERY EFFORT HAS BEEN MADE TO HAVE THE DIRECTIONS CONTAINED IN THIS PATTERN ACCURATE AND COMPLETE; HOWEVER, WE CANNOT BE RESPONSIBLE FOR TYPOGRAPHICAL ERRORS, MISINTERPRETATION, VARIANCE OR ERRORS IN WORKMANSHIP OF THE INDIVIDUAL. Reproduction of this pattern in any form (including photostat) is protected by copyright. Any infringement will lead to prosecution.